The 2500 units BGAN prepaid sim card allows you to subscribe very quickly and no contract is required.This pre-paid card is valid for 1 year and gives you 274 IP Megabytes and 2500 voice minutes. We have a range of pre-paid airtime options for the use of the Inmarsat’s BGAN network. The 2500 units pre-paid sim card can be used on BGAN terminals manufactured by Thrane & Thrane, Hughes and Addvalue. You can add units to your existing Prepaid BGAN Sim Card at any time. There is no added fee for adding units to your prepaid Sim card. To reload your sim card go to BGAN prepaid cards reload. Calls to voicemail are charged at the same rate as a call to a landline. Upon redemption of a voucher, the units will be added to the existing balance on the subscription and the expiration date of the units will be the date falling at the end of the balance extension period from the redemption of a voucher or the existing balance expiration date on the subscription, whichever is later. Validity can only be extended by adding voucher units or days extension to a prepaid card. The vouchers are to be used in combination with an activated BGAN SIM card, activated under the prepaid package. The validity period is the length of time in which units can be used once loaded onto the SIM card. Any unused units at the end of the validity period will expire and are non-refundable. *Any BGAN Terminal will operate within any of the three areas of the coverage map below. 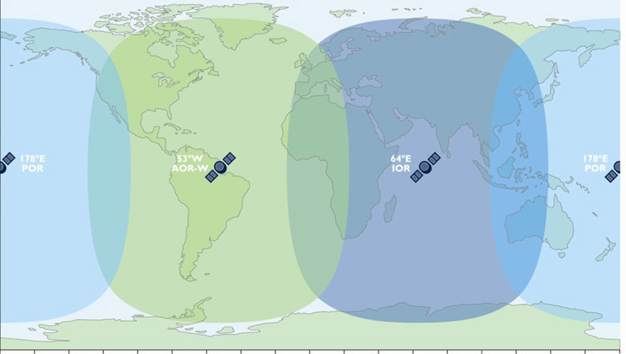 The Inmarsat network is a global system and consists of 3 Geosynchronous (Stationary, or Fixed in one position) satellites set on the equator thousands of miles above the earth. Because of the fact that the satellites are GEO, or fixed satellites, which means that they do not move from their set position, whereas LEO satellites are constantly moving. This makes it so that the equipment needs to be pointed directly at the satellite to register on the network.The Inmarsat network is actually one of the oldest networks. Their name 'Inmarsat' stands for 'International Marine Satellite'.They started as a largely marine based satellite network and mostly still are to this day. Click the button below to add the Inmarsat BGAN Prepaid 2500 Units Airtime Sim Card to your wish list.